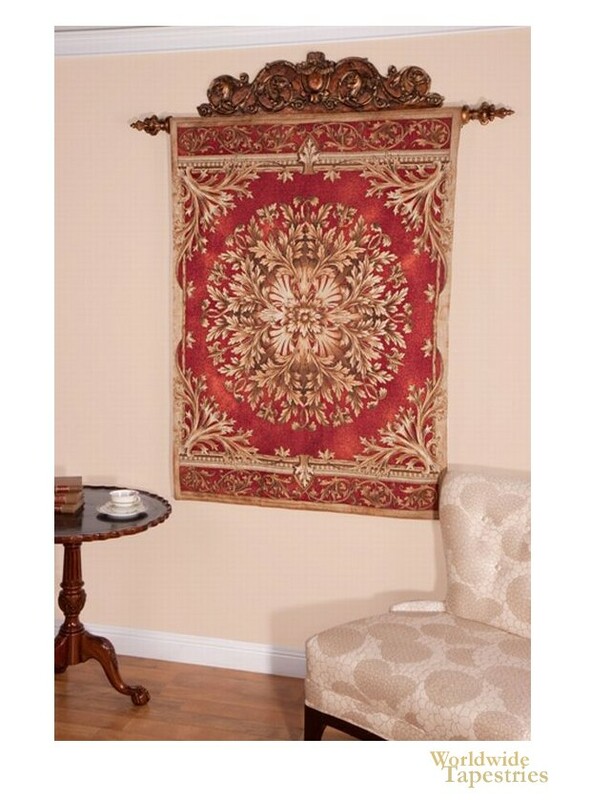 This tapestry "Grand Baroque Red" shows a floral geometric design. With rich reds and golds, as well as earth tones, this piece shows the decorative form of tapestry art inspired by French verdures and Oriental and Persian art. The central floral section contains foliage bursting forth from the center and is reminiscent of the rays of the sun, represented by foliage and flowers. This wall art tapestry "Grand Baroque Aqua" is backed with a lining and has a rod pocket for easy hanging. Note: tapestry rod, tassels, and accessories, are not included in the price. Dimensions: W 43" x H 59"
Dimensions: W 60" x H 79"